Can Am Outlander Model Guide. The Can Am Outlander models start with the smooth and docile 400 and extend all the way to the new 82 horsepower Outlander Max 1000 XT-P. You can even go two up with the Outlander Max series. Also included in the Outlander line up is the XMR 1000 for competitive ATV mudding. There's something for just about everybody. The trick is deciding which Outlander will work the best for you. That's the purpose of this guide - to give you a quick overview of each Can Am Outlander model to help you decide which of the Outlander models will work best for your type of riding. So, let's get started. 2013 Can Am Outlander Max 1000 XT-P. The 2013 model year brings quite a few updates, new models, and option packages. Here's the list. New frame with a twin beam lower section for more strength and durability. Revised suspension mounting points for better ride and handling. There is now an Outlander Max 1000! The Outlander XMR mud ATV now comes with the 82 horsepower 1000 engine. New DPS option includes power steering, aluminum wheels, and quick lock diff. The XT-P option package adds premium Fox Podium shocks to the XT package. 400 - Strong running single cylinder, fuel injected Rotax engine. Trick digital gage cluster with multi-function display. Good handling and ergonomics. Good skid protection for running gear and brakes, if you don't mind a few dents in the bottom frame rail. When in 4 wheel drive, the visco-lok front differential reacts quicker than last year. The bad would be the brakes. They stop OK, but have lousy feel. Not a fan of linked brakes, especially with a left hand lever. I don't know who does market research for these companies, but somebody needs to tell 'em that a lot of ATV riders also spent time on motorcycles. And bikes don't have left hand brake levers! Potentially bad are reports that in muddy conditions, the radiator is getting clogged with mud and causing overheating problems. Most seem to think the body panel in front of the rad is to blame. 400 Max - 8 inches longer and 50 pounds heavier. 200 lb. more towing capacity. Seating for two. If you ride 2 up more often than not, this may be the best choice for you. This is the one that put the Can Am Outlander line on the map. 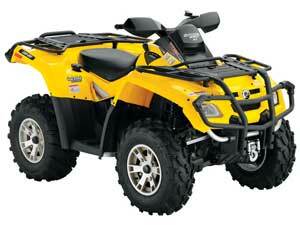 Click here for Can Am Outlander 400 specifications. 500 - Smallest of the Rotax V-twins, runs with most 650s. Good combination of ride and handling. Comfortable riding position. Useful racks front and rear, but can limit your ability to move around on the seat in tight going. Also has the recalibrated visco-lok. I like horsepower and fuel injection. I don't like it when it's hard to control. This may be one of those times. It depends on what kind of riding you do. If you like wide open spaces and don't do a lot of tedious, low speed work, you won't have a problem. But between the soft low end power and the response of the fuel injection, it can make tight, low speed riding a challenge. Then there's the brakes. Basically the same complaint as the 400. Not a lot of feel, left hand lever, noisy, prone to fade when wet. You also need to know the 500 leans more toward sport than utility. The handling suffers noticeably with a load on the racks, and the lack of low end power makes slow speed work tougher than it needs to be. 500 Max - Once again, 8 inches longer but this time only 43 lbs. heavier. Still has over 5 gal. of rear storage combined with a convertible rack system with backrest. 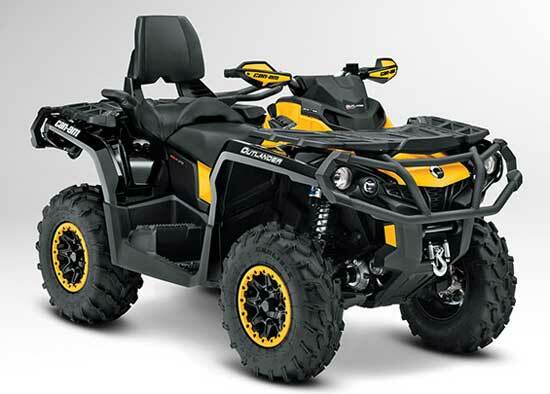 This Can Am Outlander model is a favorite with farmers and ranchers. Outlander 650 with XT package. 650 - By most accounts, this ATV hits the sweet spot. It seems to be a favorite of the magazine guys, along with the regular Joes that post their opinions in the forums. It has that "just right" combination of power, handling, comfort, ride, and versatility. You have to really dig to find anyone with anything negative to say about this Can Am Outlander model. The biggest complaint? ... lack of bash protection for the exposed underside of the frame. Easily fixed with a good skid plate. My 2 cents worth? I still don't like the brakes. Fix that and this thing couldn't get much better. Don't believe me? Ask somebody that owns one. 650 Max - The Max can strut its stuff in the 650. It has enough power that taking along a passenger is not something you try to avoid. Yet when going solo, you don't feel you have too much ATV to herd. 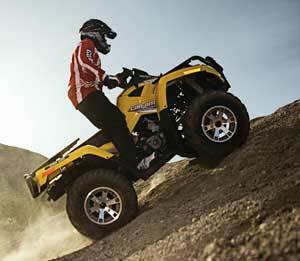 Of all the Can-Am ATV Outlanders out there, this one may be the most versatile of them all. 800 - If you think you need more power than the 650 ... you may be better off spending your money on therapy. If you want more power ... that's different. And you're exactly who the feisty folks at Bombardier had in mind when they built the Can Am Outlander 800. When wretched excess seems normal to you, step right up to this utility ATV that can shame many of the sport ATVs out there. Don't even bother asking about the power ... way, way more than any sane person needs. Cons? Pretty much the same as other Outlander models. Only magnified by the blinding speed of this thing. Prone to frame damage if you don't bolt on decent skid plates. Weird brake set up with very little feel. Front shocks could be a problem if you push it in the rough stuff. The speed and weight of the 800 can get you to that point real quick! Also some reports about doing damage to the rear trailing arms in high speed rough riding. When your riding includes a lot of water, there have been complaints about the CVT belt getting wet and slipping. Just a heads up. To be fair, this laundry list of negatives is only likely to surface at the extreme end of the riding spectrum. Just thought you needed to know. 800 Max - Plenty of room to bring along a passenger to terrify. The longer wheelbase may add some stability at speed but makes turning a little slower. Maybe that's a good thing? 1000 - Take what we said about the 800R and add even more power. 2013 models will come standard with the DPS power steering package. Which is OK, you would want it anyway. When you're wrestling 82 horsepower and over 800 pounds, you need a little help. As of now, this is the fastest sport/utility ATV on the planet. 1000 Max - All new for 2013. The Outlander Max adds the 1000 engine, and gets a new second generation frame to go with it. Plenty of room to carry more stuff and more people, which you probably won't notice with all the extra power on hand! How much more? In addition to a passenger, the racks will hold 300 pounds, and you can tow 1,300 pounds. Need more than that? May we suggest buying a truck? 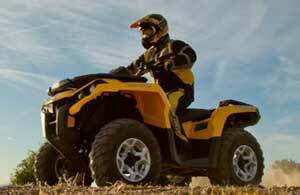 Outlander XMR - This Can Am Outlander model is for serious mud riding. Can Am looked at what most riders were modifying on their ATVs to make them go in the mud, and did it for you! The list includes high mounted radiator, integrated snorkel system, adjustable air controlled suspension, Gorilla tires, special mud riding pegs, and more. Can Am must have been feeling generous for 2013, the XMR also gets the new Outlander Max frame and the big 1000 engine. They even threw in an optional Camo paint scheme just for fun. If you were a fan of the XMR 800, there might be some 2012 models left over if you hurry to your dealer. Because it's the 1000 or nothing now. We will add that the XMR makes a good trail riding ATV at slower speeds. It's speed limited to 55 mph, so that kind of takes care of itself. We found that the lower gearing, the ability to control ride height with the air controlled suspension, power steering, and big tires, worked well in tight and rugged trial situations. For those same reasons, it makes most work chores a snap. So even if you don't plan to compete in ATV mudding events, the XMR could be a good choice as an all around sport/utility ATV. Bargain priced DPS option includes power steering, aluminum wheels, and quick lock front differential. DPS - This is a new option package for 2013. $900 gets you the three position electric power steering, the quicker locking front differential, and cast aluminum wheels. The DPS option is available on all Outlander models except the 400. XT Package - This option package can be added to any Outlander model. Includes upgraded wheels and tires, winch with remote control and on board storage for it, handlebar wind deflectors, and heavy duty front and rear bumpers. The larger Outlander models, starting with the 500, include all the above plus the three mode electric power steering unit. A quicker locking front differential is also part of the package for the power steering models. XT-P - Another new option for the 2013 Can Am Outlander 800 and 1000. The P package adds Fox Podium Piggyback Reservoir shocks at both the front and rear to everything already included in the XT package. You'll get some functional 12 inch beadlock wheels too. Specifications for 2013 Can Am Outlander 500, 650, 800, and 1000 models.